Three Greeley, Colorado kindergartners, two girls and one boy, feed a chicken and her chicks in the schoolyard of their school in Weld County. The two girls, both of whom wear large bows in their hair, stick their hands into a paper bag inside a wicker basket on the ground and pull food out it for the animals. The little boy watches intently as the hen and her chicks scratch for food among the two water dishes on the ground.. Photo courtesy of the Denver Public Library. Girls pose outdoors at the Sopris School in Sopris (Las Animas County), Colorado. They wear costumes possibly for a play. Photo courtesy of History Colorado & the Denver Public Library. A blizzard in 1913 piled the snow high in Denver, turning Eighth Avenue, below, into a snow run for sledders and a reminder for us that monstrous snowstorms are nothing new in Denver. Photograph of a kindergarten class at Columbian Elementary School in Denver, Colorado during a traffic safety lesson dramatic play exercise. One boy stands with his arm raised, blowing a whistle by a "Stop" sign dressed as a traffic officer. One boy "drives" towards him in a push car and two other boys dressed as police officers ride tricycles toward the "intersection" in the opposite direction . Wood blocks define the road while other children stand and watch. One girl stands ready to push a baby carriage into the intersection. Boys and girls ride a donkey and crowd a wagon in (probably) Colorado; houses are in the background. Courtesy of History Colorado & the Denver Public Library. Teenagers and girls play in the sand by Lake Rhoda at Lakeside Amusement Park in Lakeside (Jefferson County), Colorado; a lifeguard on a tower watches swimmers. Courtesy of History Colorado & the Denver Public Library. Used by the Keota School , Keota, Colorado. Courtesy of History Colorado. 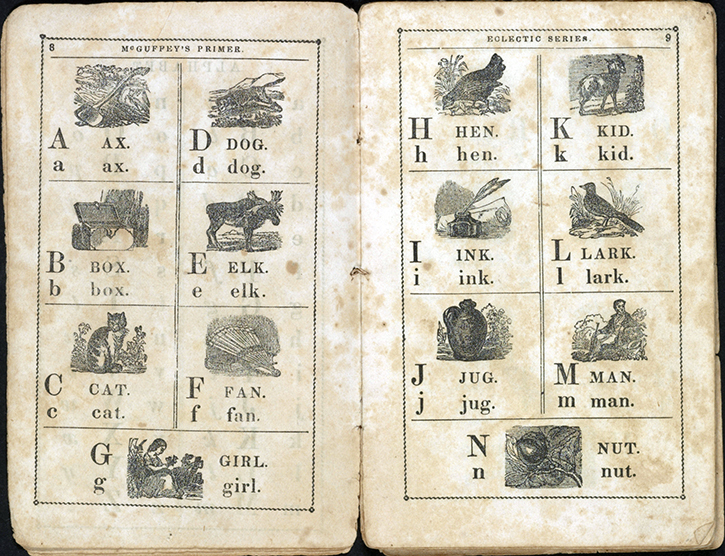 William Holmes McGuffey was hired in the 1830s by Truman and Smith, a Cincinnati publishing firm, to write school books appropriate for children in the expanding nation. His eclectic readers were graded, meaning a student started with the primer and, as his reading abilities improved, moved from the first through the sixth reader. Courtesy of the Library of Congress. This is one from 1924. It has stories about growing crops, other places around the world, and things like pictures of yaks from Tibet.